This is the first of two posts that are part of the 2nd Annual Grace Kelly Blogathon being held over at The Wonderful World of Cinema by Virginie. Tnx for letting me participate! Brief Synopsis – A retired cat burglar living in France tries to catch a copycat thief in order to clear his name when the police think that he has returned to a life of crime. 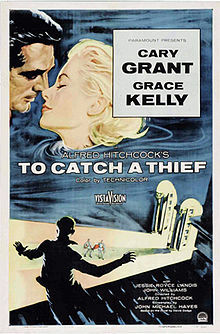 My Take on it – In my continuing quest to finally see more and more films made by Hitchcock, I chose to watch this one for this wonderful Grace Kelly blogathon. Having never seen this film, I was expecting something more and was actually quite disappointed that this wasn’t more thrilling to watch. This is perhaps one of my least favorite mainstream Hitchcock films and I think part of that has to do with the plot and the setting. The characters all seem so out of place in France and it might have worked much better had they been in a different location. Cray Grant is good here in the lead despite the fact that he seems (and is) so much older than his two female costars. Both Grace Kelly and Brigitte Auber are fun to watch here in their respective roles, but they both lack enough chemistry with Grant as one would expect. This feels a bit too tame and doesn’t work as well as it probably could have. Bottom Line – I think this is one of Hitchcock’s weaker films perhaps due to the French setting. Grant is good here but despite being one of Hitchcock’s favorite players feels too old for the part. Kelly and Auber both do a nice job as the women after Grants heart but there is a bit of chemistry missing between the woman and the lead. The story feels a bit too tame and isn’t as thrilling as I would have hoped. Thanks for taking part to the blogathon!